There’s one enemy and it’s the headcrab. There’s one weapon and it’s the crowbar. 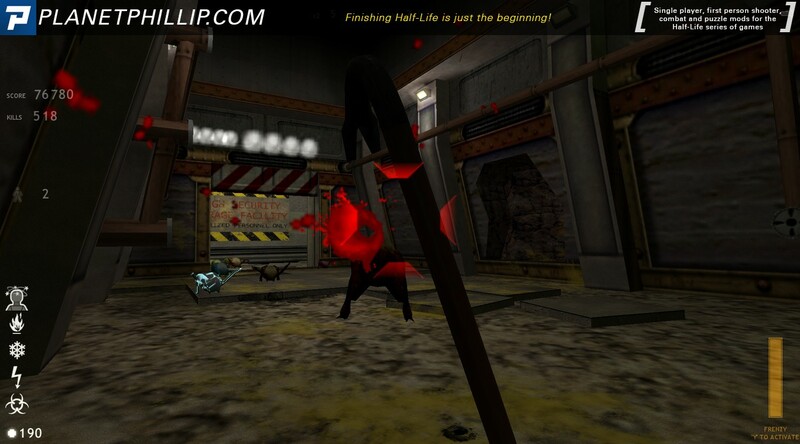 Although you can play this online in MP mode, you can also play it locally, aiming to stay alive as long as possible and beat your personal high score. 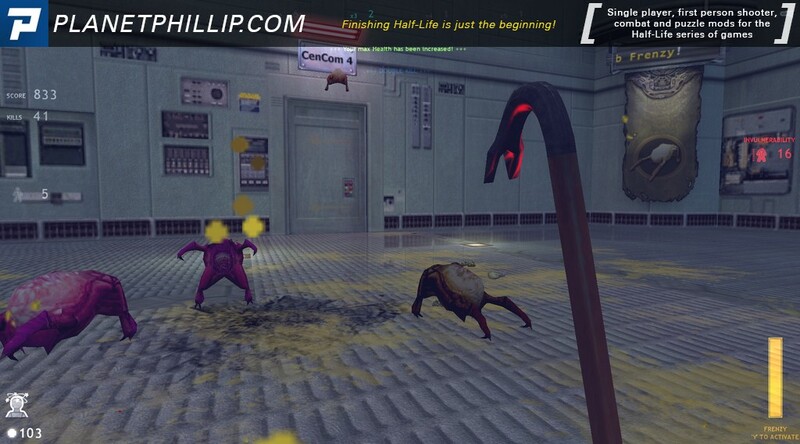 When you kill 100 headcrabs, you gain extra life. 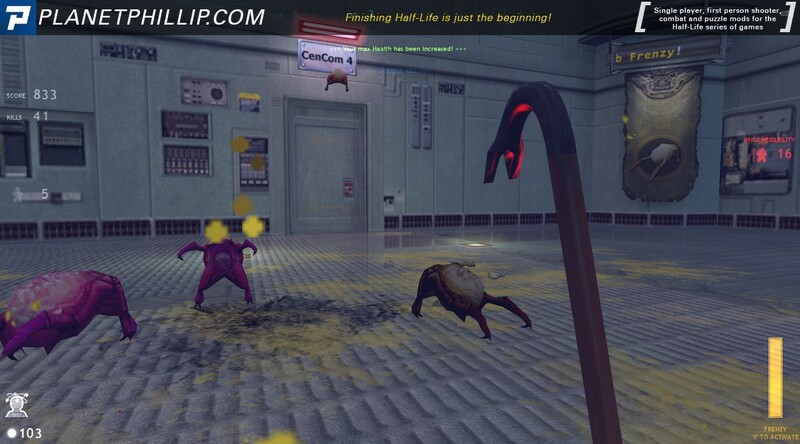 Headcrabs’ health and damage increases over the time also! 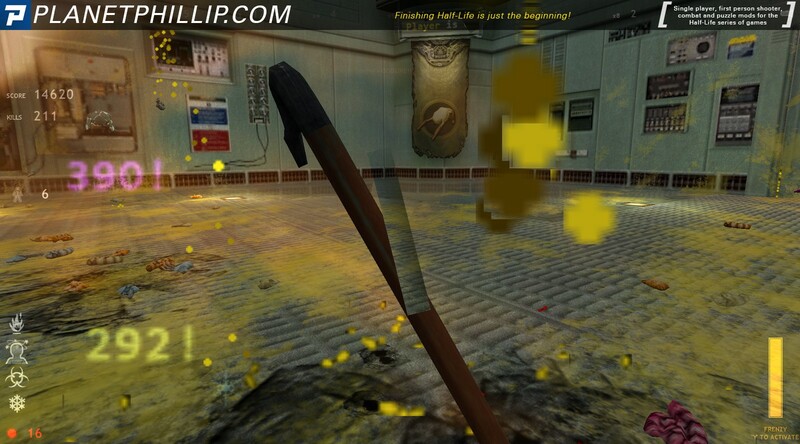 Combo temporarily increases you crowbar’s damage, the higher is combo – the longer is increase. When you kill headcrabs, you gain “frenzy”. Combos give additional “frenzy” points. If your “frenzy” is full, you may activate it with RELOAD key, and do 16x damage! Secondary attack of the crowbar is more powerful, but is slower. The amount of “frenzy” points got for killing by such attack, depends on weapon’s upgrade value. If the secondary attack doesn’t kill a headcrab, it pushes him away. It is also possible to push away other players! Every minute your crowbar is slightly upgraded – it does more damage and “frenzy” mode lasts for a longer time. 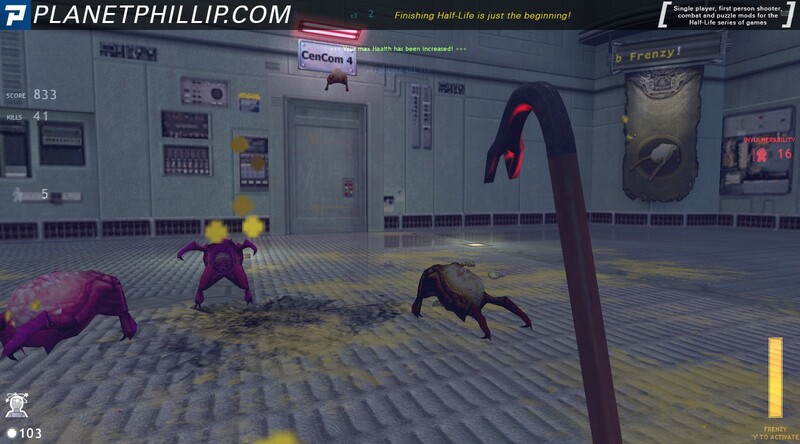 If you kill headcrab tracking you with anything but you crowbar, you get an extra score! This is called “Nice catch”. 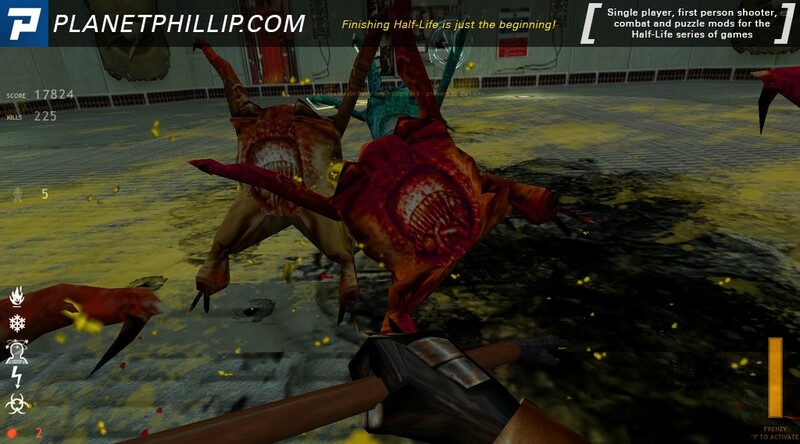 Ladder – different headcrab types are spawned sequentially. 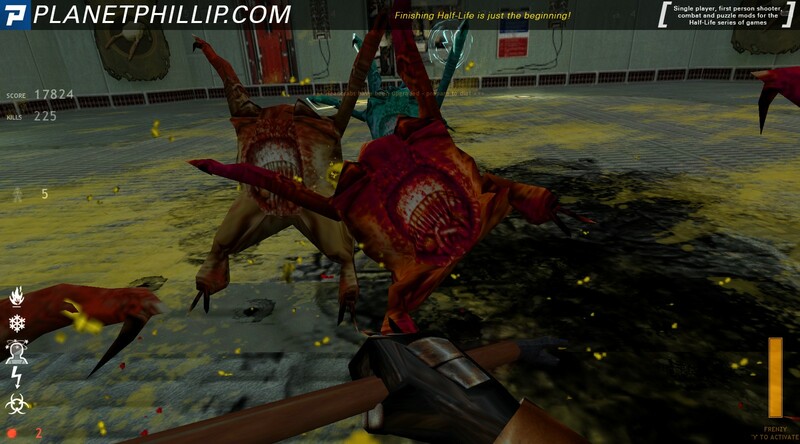 Random – all headcrab types are spawned randomly. Ladder mode goes into this mode after all types are spawned. Invulnerability – player is physically invulnerable for all damage types. 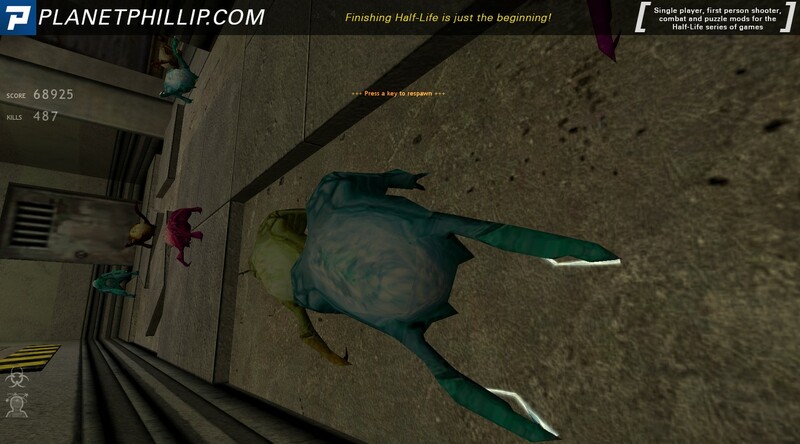 Invisibility – headcrabs don’t attack a player although still track him. Regeneration – health regeneration is 3 times faster (6 hp/sec). Powerups last for 20 seconds. They respawn in one minute plus-minus several seconds in single player mode. In multiplayer, it is tweaked by hcf_powerupMinRespawn and hcf_powerupMaxRespawn server variables. 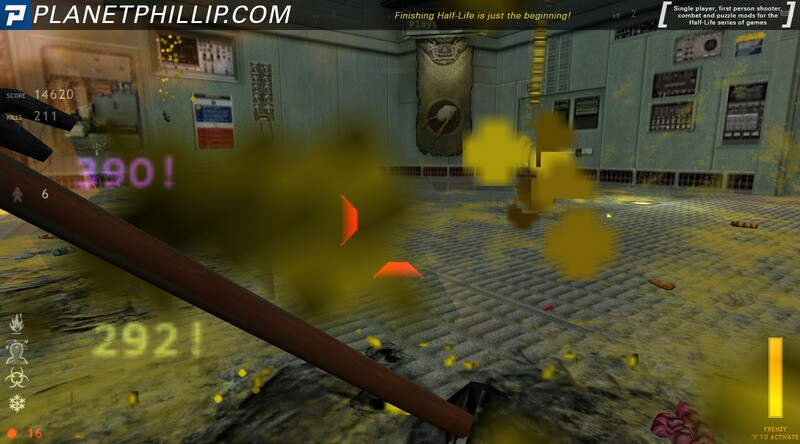 There may be powerups of the certain type on maps, or a Random Power-up – it may be different on every respawn. To turn powerups off, server may use a console variable hcf_allowpowerups, setting it to zero. There are 4 maps in the mod. 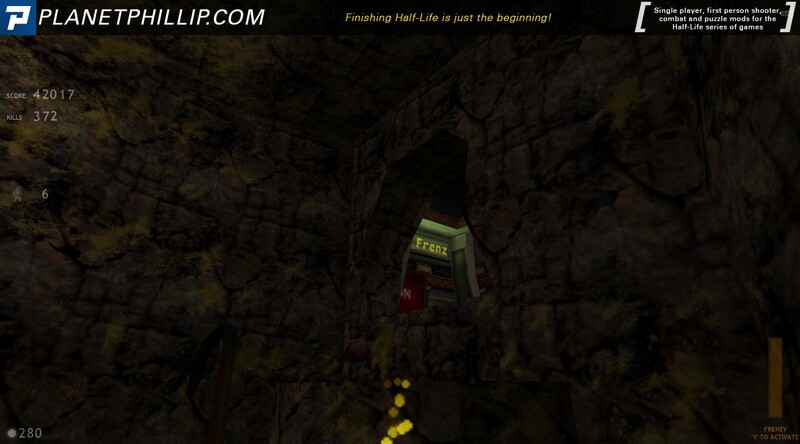 After completing a level and learning the score, press Space in several seconds, and there would be a map change. 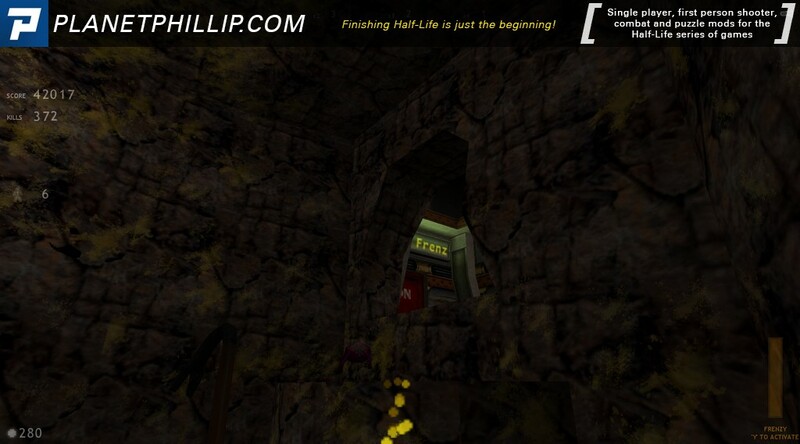 In a singleplayer mode, your highest scores are saved locally. High scores are stored individually for each map, game type and difficulcy level (Easy, Medium, Hard). Start the game after all players are in. It also can be restarted (using a hcf_restart command). To restart an internet server, use a spectator vote system. 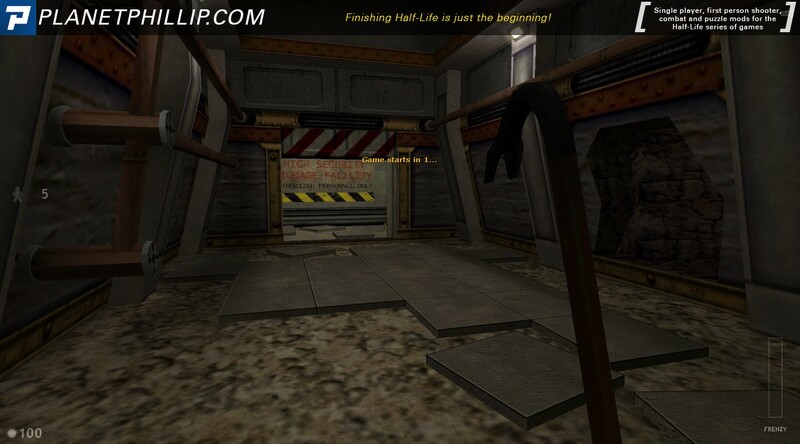 Copy the hcf folder into your Half-Life folder. Headcrab Frenzy! should now be listed in your Library tab. If you enjoy this style of game, then I suspect you will enjoy this. I don’t so that’s why it gets a MAYBE from me. I do have to say that the implementation is very well done and the only things I would like changed are 1. make proper places for the headcrabs to appear from, vents, holes etc and 2 make the progression slower. It seemed to get hard REALLY quickly. Anyway, can you beta my high score of 76780? Yeah, I didn’t really enjoy this map. Even by its concept, it didn’t sound good at the start, and I was right when I was done with it. It gets very repetitive quick. It’s not that I don’t like killing headcrabs, it’s just that it gets very, VERY boring later on. Trust me. The only reason this gets a maybe is because the modder put a lot of effort into it, and you can see it with the online leaderboards, the different powerups and enemies and such. But even that won’t get me playing it, unfortunately. Overall, play this only if you want to. P.S. I miss HL1 mods, please post more Phillip! But that’s a lot to read for a small mod and I don’t think I understand it all anyway. And powerups should be 20 or 30s, not 60 meh. I sometimes wonder if you have a sense of humour. I had already checked the site, but those are MP scores and I don’t really know if it’s easier , the same or harder. I was just subtly challenging people to play the mod. I know you were, but then again I didn’t know if you tried mp as well? your score didn’t mention sp only. Although the map work is nice and the effort that was put towards development is visible, the game is tedious and gets boring rather quickly. Well this is a big maybe for me. Why? because is just a single and simple arena map, actually a room, where dozens and dozens of headcrabs are thrown at you. 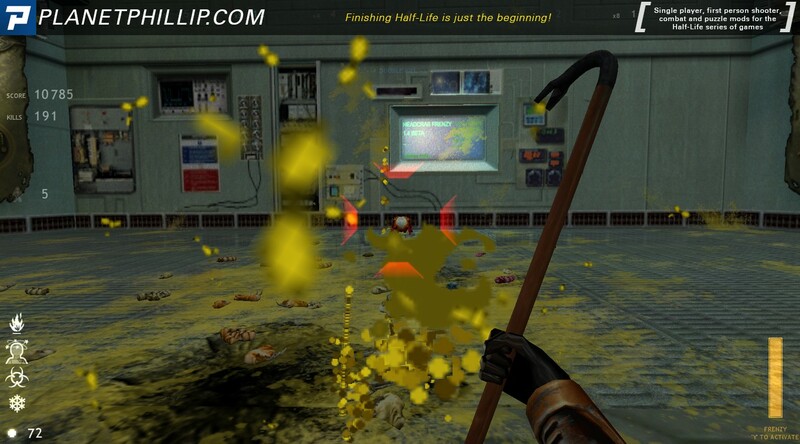 I actually didn’t find this enjoyable and in my experience this was not much fun, maybe some new arenas and environments along with more weapons besides the boring crowbar could have worked better. 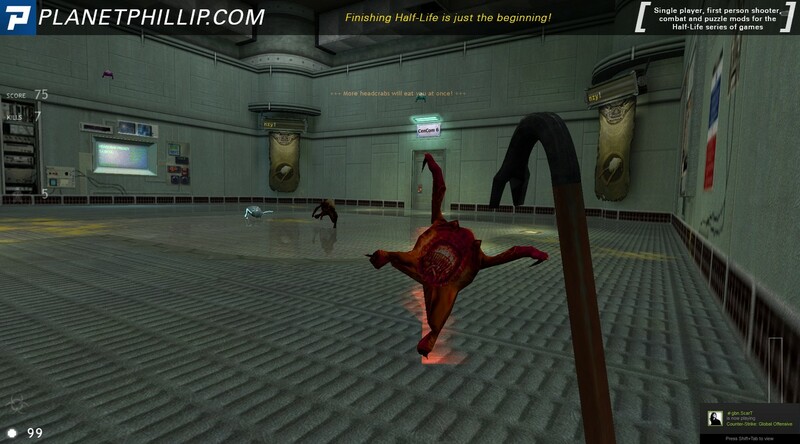 Also the whole feeling is quite boring as at least in my opinion I consider the headcrab is not a good enemy to beat in HL1, sorry for those headcrab lovers but just killing those bugs is not my cup of tea. This mod is really intended as a multiplayer one, though I struggle to see how well that would work.. 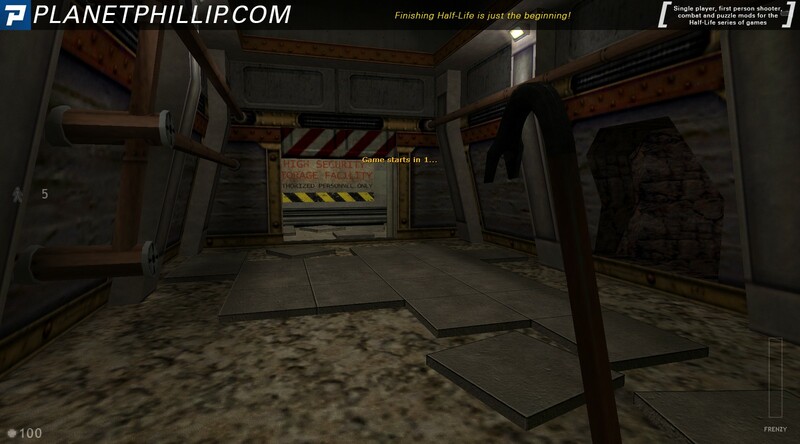 While the levels have decent detailing, they are all set in single, cramped, square rooms. Three out of four of them just boxes, so I don’t understand why other people are praising the map design. This is an arena game with a never ending battle against an infinite amount of respawning headcrabs. While I don’t hate arena games, they tend to suffer from a lot of the tedium that starts to settle in when a game is never ending. This one amplifies that tedium by giving the player no room to move and nothing to explore. It suffers from the classic Tetris issue where you could keep going forever if you don’t lose (and thanks to one exploit in one map, you never will lose). To be fair, the gimmicks to the headcrabs themselves are kind of interesting, each one applying a different kind of damage effect and having a different look, though in play they don’t really stand out because there’s so many of them. Also, they’re headcrabs. They have one and only one type of attack. That gets really boring. I feel like if this were a wave-based game and the levels were more interesting, this could do so much better. Sadly, the amount of enjoyment that comes out of playing it is not worth the amount of effort put in by the developer.